A pooper scooper business is a new and expanding home based business opportunity. Business is piling up. Bad puns aside, this is an excellent business opportunity that can provide a good income. These businesses have started in the U.S., Canada and Australia. Pooper scoopers capitalize on families with dual family income professionals and executives who lack the time or desire to do yard work and maintenance. Picking up yard waste that Fido produces on a daily basis isn't high on their list. 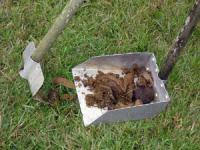 Because the problem of dog waste can quickly get out of hand, they are willing to pay for a dog waste removal service. Dogs are prolific eaters and poop a lot. Yards can get filled rather quickly, because dogs are territorial. They usually pick certain spots in the yard where they do their thing. But once these spots are filled, they move on, making deposits elsewhere. Dirty yards are annoying to homeowners and neighbors. Dog waste has a strong smell, contributes to ground water pollution, breeds flies, and is easily tracked inside the house. Some city trash removal departments discourage dog waste mixed with household waste, requiring separate containers and bagged material. Single-family homes are the primary market for your pooper scooper business, but commercial strip malls, apartments or condominiums with grounds accessible by passing pooches should be considered as possible business. Initial reaction to your pooper scooper offer may be skepticism, but if you use a professional approach with a sense of humor, you'll make connections and gain accounts. Develop and print professionally produced fliers and Business Cards designed specifically for the professional pooper scooper. Don't use hand-written photocopies because they look cheap. Door-to-door canvassing is good for a start, combined with running classified ads in neighborhood weekly shoppers or the service section of daily newspapers. Limits shopper display ads to business card sizes. List your service with the International Directory of Dog Waste Removal Services. This Web site provides information on starting, running, and growing your business in the United States. Depending upon your ambition, this service business can grow from a single employee (you) to several crews and hundreds of weekly accounts. Seasonal slowdowns due to weather like snowstorms or heavy rains can temporarily halt operations, but snow and rain won't stop dogs from depositing, and frozen doo-doo is actually easier to pick up. Dog Waste cleanup charges will vary depending upon income levels of residential neighborhoods within driving distance. Average fees are $7.50-$15.00 per dog per week. First-time cleanups will take the most time depending upon the amount of waste each yard contains and how long it's been there. A first or one-time yard cleanup may take an hour. Determine what you need to make and break this figure down to an hourly rate. Figure $7.50 per dog for 15 minutes work, $30 an hour to start. Multiply that by the number of dogs and size of the yard, and your initial cleaning fee becomes $45+. It will take a few yards to begin to establish time-savings techniques. Initial investment should be about $200-$250 for shovels, brooms and lobby-style dustpans, garbage bags, buckets, rakes, hand trowels, face dust masks, gloves, trash cans with tight-fitting lids that you can use to haul the waste around town as you work without offending sensitive neighbors. You'll need a pickup truck to haul equipment and waste, and vehicle signs. You can add uniforms or wait until cash flow permits.Buy an answering machine or voice mail service from your land line phone provider and record a simple script. Speak clearly and distinctly. Don't let your child make the recording because some professionals find these irritating. Pick up multi-part receipt books for customer receipts from an office supply store. Buy a computer to track accounts and business-related expenses. Call your city administration offices for information on requirements for disposing animal waste, dump fees, business license requirements, certificates of occupancy and DBA filings. Because the nature of the pooper scooper service business is unusual, the potential for publicity is great. Contact your local newspaper, community news or business section and speak to the editor. Do the same with local radio stations. From information and experience gained from your door-to-door canvassing, prepare a list of answers to questions you'll encounter and tell each editor in 30 seconds what it is you do. You'll either quickly develop interest or gain a quick dismissal. Pooper scooper business provides a nice hook for both print, broadcast and Internet media sources. Developing a website for your business provides easy information access for potential customers. This form of marketing using the Internet provides a url that can be included in your print publicity.